Accessing the web interface of your phone is useful for configuring your device and changing settings. Rather than use the phone buttons and screen to set up your phone, you will instead use your web browser. In many cases you'll find it easier to do it via this method, and often there are more configuration options in the web interface than on the phone itself. Firstly, make sure you are on a computer that is on the same network as your phone, and that your phone is turned on. 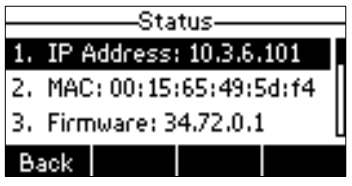 The IP address of your device will be shown on the screen. Simply enter this into a web browser (where you would usually enter a website address) to access the web interface. A login page will load. If you purchased the phone from Gradwell then please read this article for details of the username and password for your device. Otherwise both the username and password will be 'admin' (please read this article for why it is a good idea to change your web interface login). 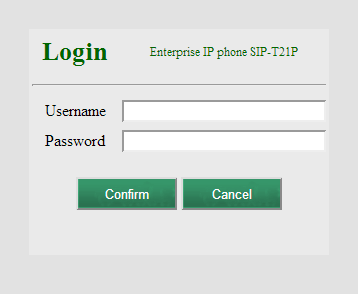 You should now be successfully logged in to the web interface of your phone.